Couples or those traveling together who want to be able to chat with each other will want to sit in the center paired seats, such as 2E and 2F. Since I was late in selecting my seats, I ended up in seat 1E, even though I was traveling solo, but there's a privacy divider that can be raised and for a night flight I wasn't too bothered about not being able to look out the window. 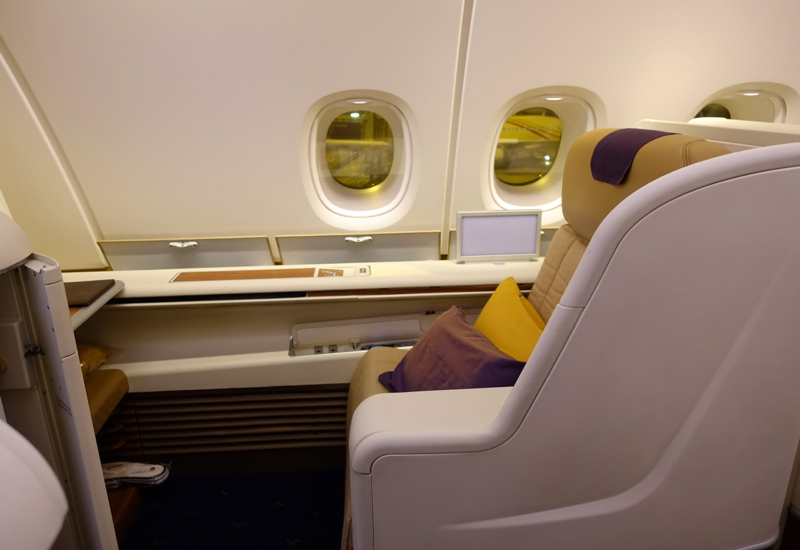 Each First Class seat is 26.5 inches wide, which is wider than Asiana First Class and Emirates First Class, but nowhere close to as wide as Singapore Suites or Cathay Pacific First Class. 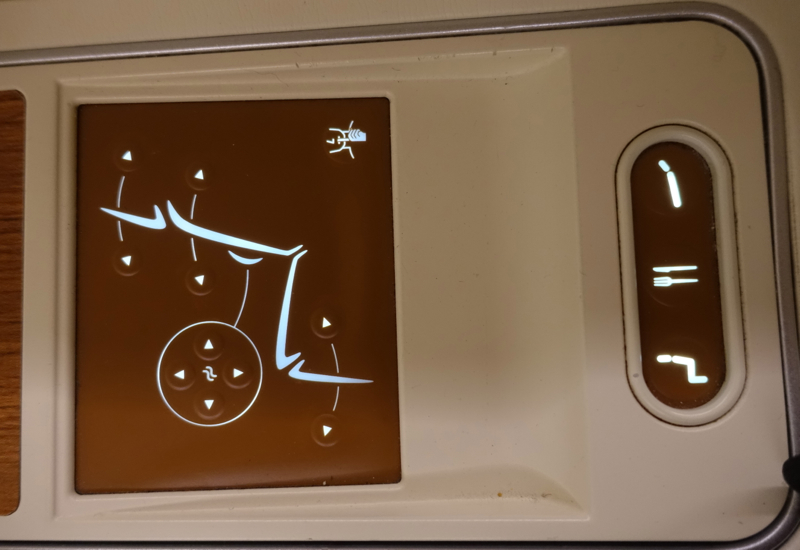 It was comfortable enough, although I do find the Cathay Pacific first class seat to be better padded. 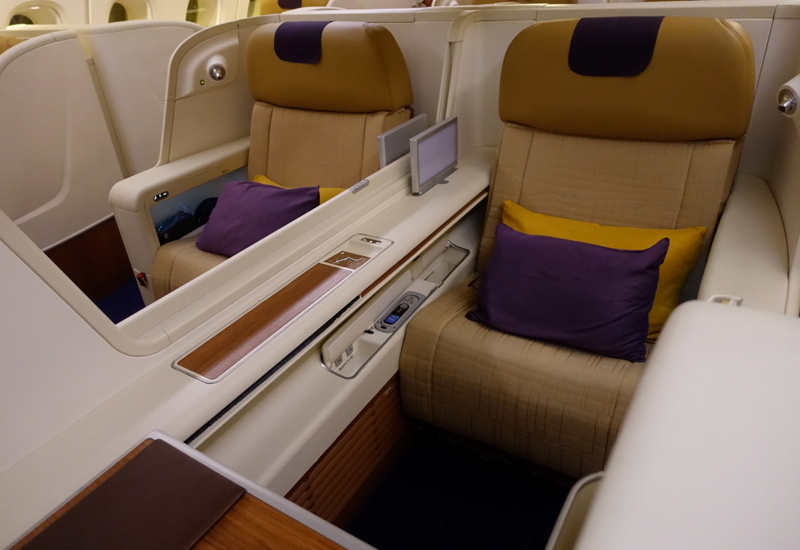 One thing to note is that there's no ottoman with these seats, so if traveling with a companion you can't dine across from each other, as you can in first class on Asiana, Cathay Pacific, Etihad, British Airways, etc. 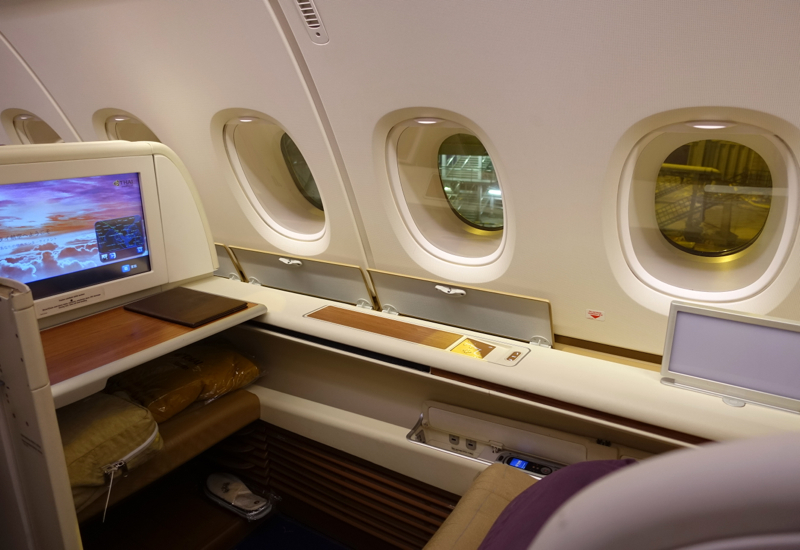 Instead, there's storage space on the shelf under the IFE screen (you'll find your blanket and slippers stowed here) as well as in smaller compartments under the arm rest. 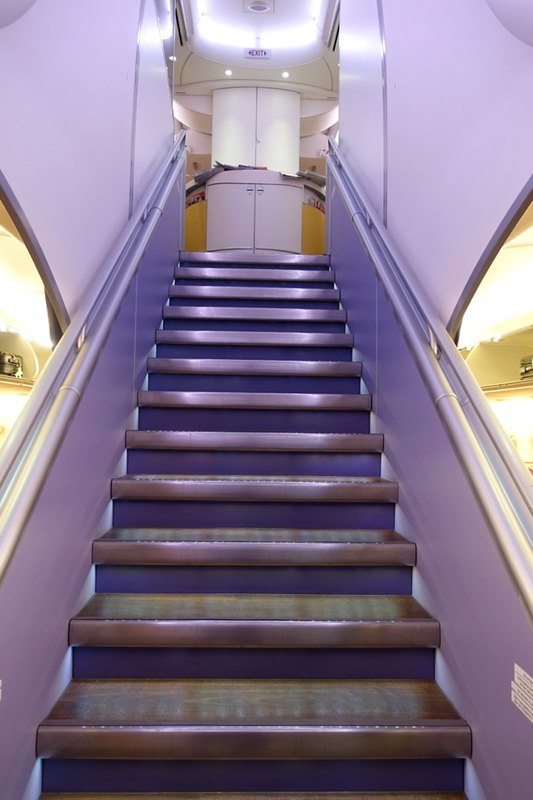 After being welcomed onboard and ushered up the stairs to the A380's upper deck, I took a few photos of the cabin then seated myself in 1E. 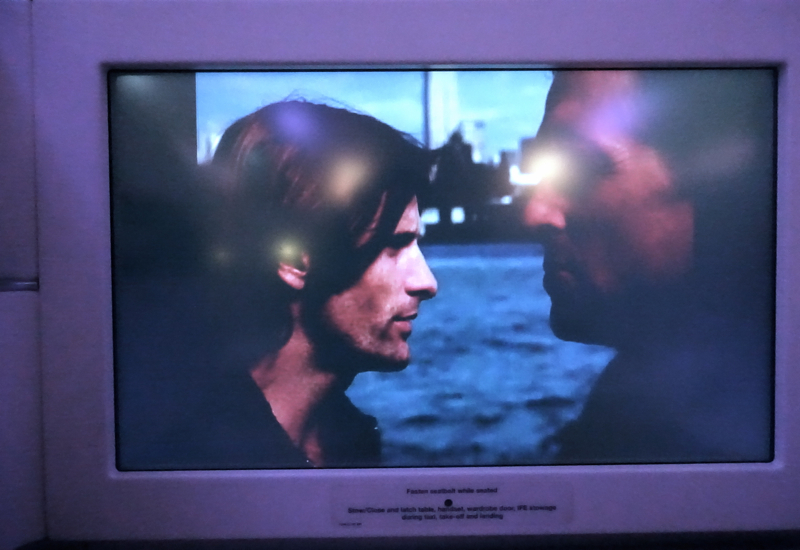 One of the flight attendants started speaking to me in Thai before switching to English, when it became evident I wasn't a Thai speaker. She then asked me which size of pajamas I'd like. I asked for a medium, figuring that a Thai sizing was bound to run small on me, but medium turned out to be bigger than expected, so a small was a better fit, apart from being too short in the legs. 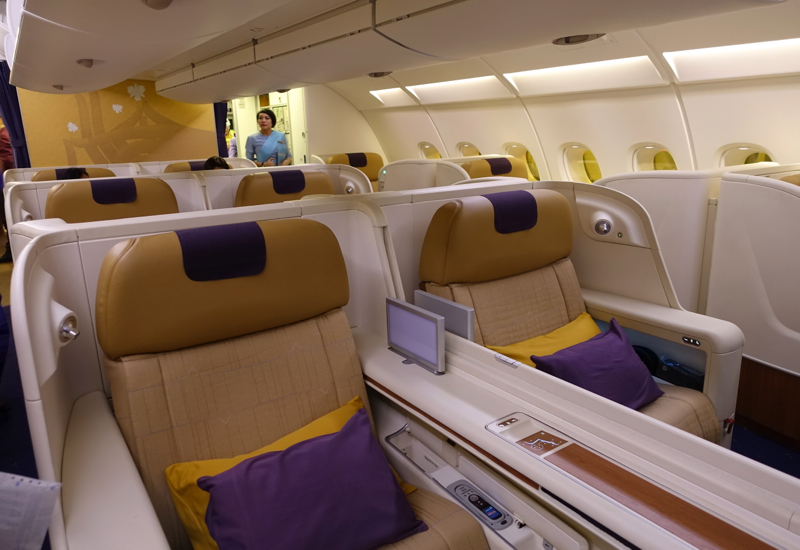 Unlike Thai's usual purple color scheme, the pajamas were thin (in my view, too thin) and light blue. These are my least favorite first class pajamas of the carriers I've flown, not that this is a key criterion for me at least, in the overall flight experience. 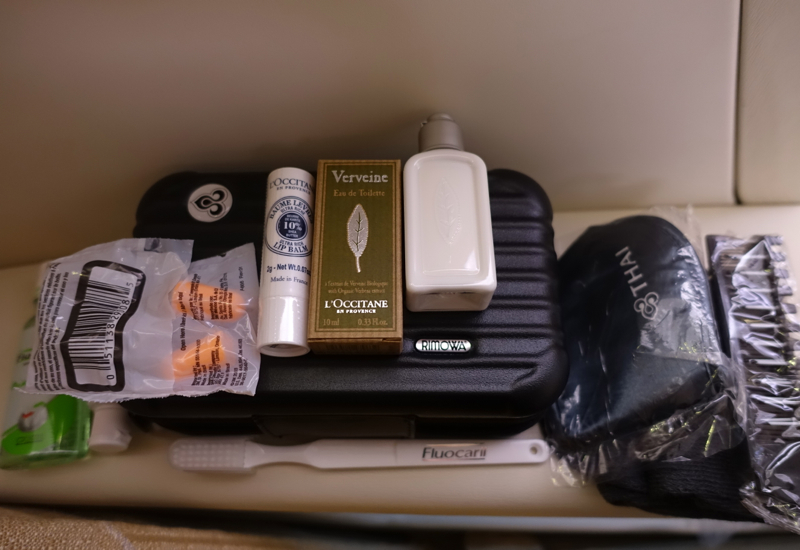 The amenity kit should appeal to Rimowa fans, although I'm not one of them and left the kit (though not the L'Occitane amenities) on the aircraft. Inside were the usual earplugs, sleep mask, toothbrush and toothpaste and brush/comb, along with L'Occitane moisturizer, lip balm and my favorite, the Verveine Eau de Toilette. And although it was a no name brand, I was happy to see mouthwash. I was a little surprised that a separate facial cream wasn't included, although since I always travel with my own products it wasn't needed–just an unusual omission. 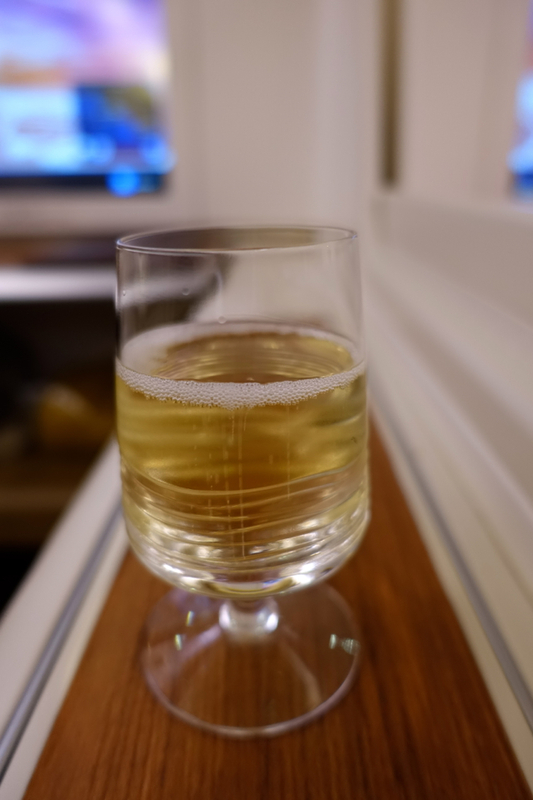 We were also offered a pre-flight drink, and while I'm not a big champagne drinker and almost always prefer wine, I decided to take the flight attendant up on a glass of Dom Perignon 2004 champagne. 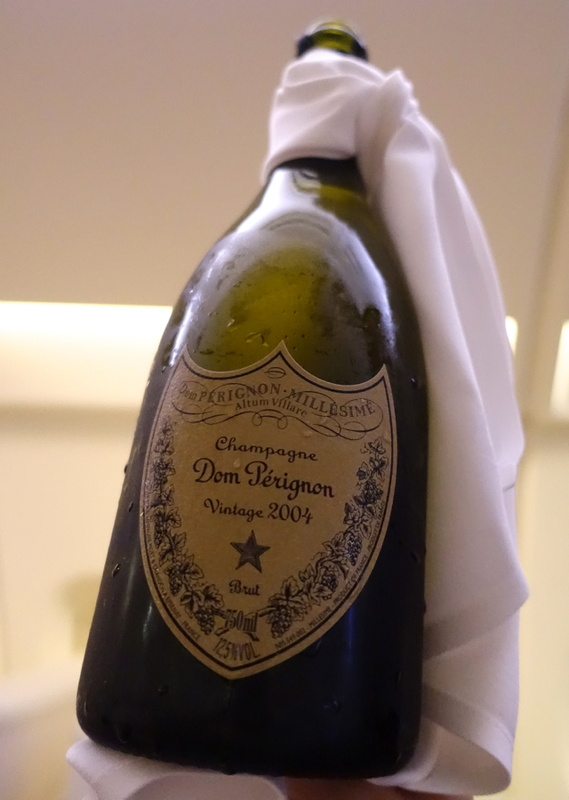 Even for me as a very occasional champagne drinker, it was delicious. A little something to nibble on to accompany it would have been nice, however. After we were airborne and at cruising altitude, the meal service began. 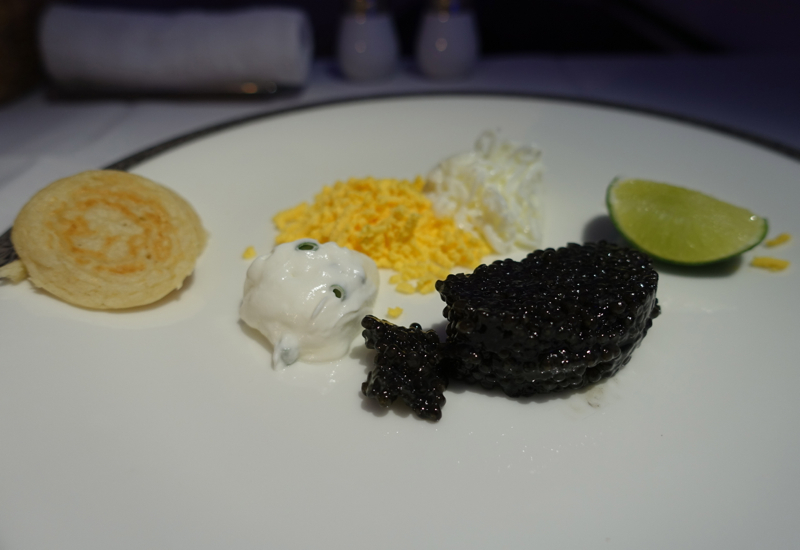 When caviar service is offered, I always accept, and Thai does offer white sturgeon caviar with the usual accompaniments. 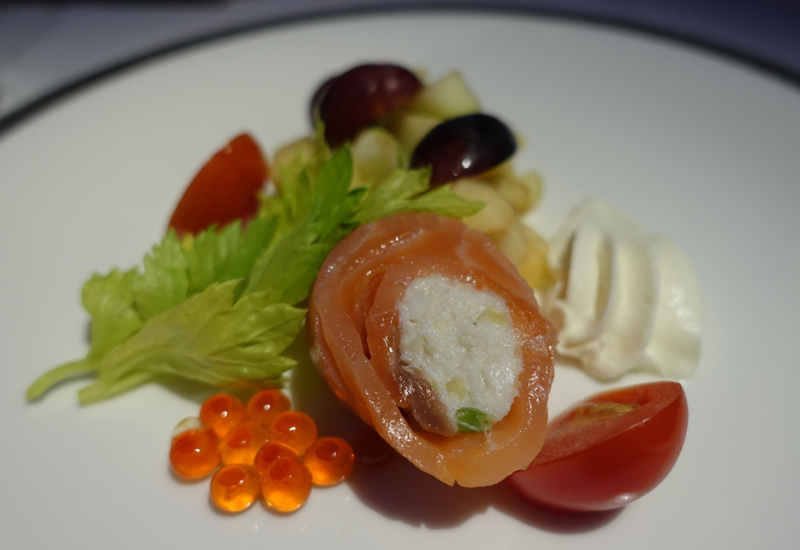 After the caviar service, there was an appetizer of smoked salmon crab roll and salmon roe. This was tasty, though I found the pairing with green apple and grapes a bit odd. 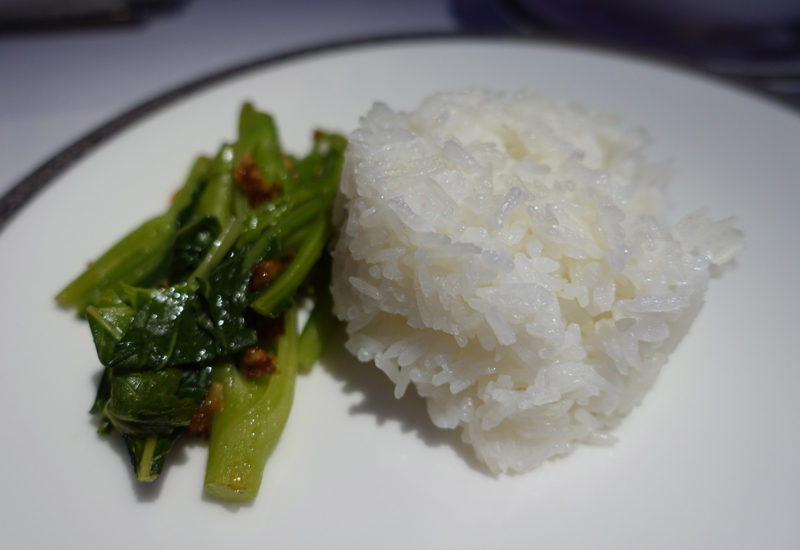 Thai Royal First Class allows you to pre-order meals when departing Bangkok (see Best Airlines to Pre-Order Meals). I decided to pre-order the Prawn Penang Curry. 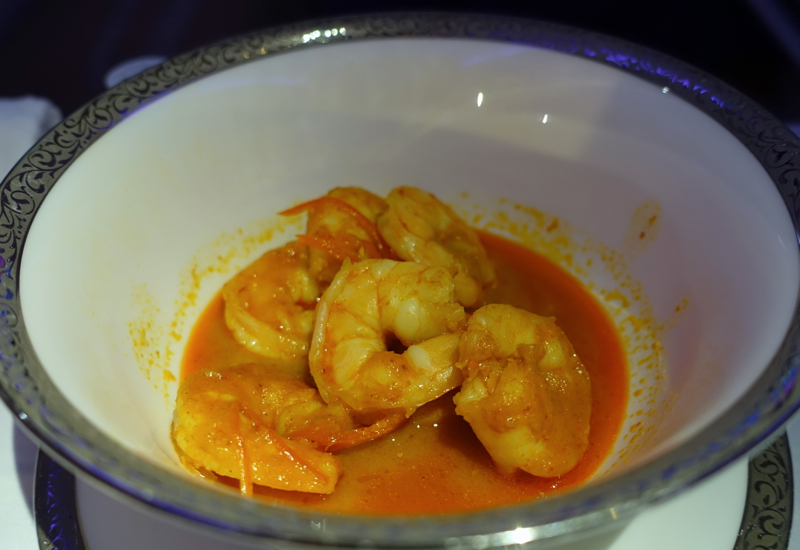 I was happy to have pre-ordered this, since the dinner menu didn't offer any Thai curries as options, only Prawns with Sweet Chili Sauce. The Penang Curry was fine, although not spicy at all, and I actually preferred the curry I had in the Thai First Class Lounge. I liked that the accompanying vegetable was perfectly crisp tender, however. The portion was the right size for me, given the preceding caviar service and appetizer, but it would have been insufficient for my husband. So if you're big/tall or just really hungry, you may need more than one main course. Thai cuisine, as with most other Asian cuisines, isn't exactly renowned for its desserts, so it wasn't surprising that the dessert course was the weakest part of the dinner. 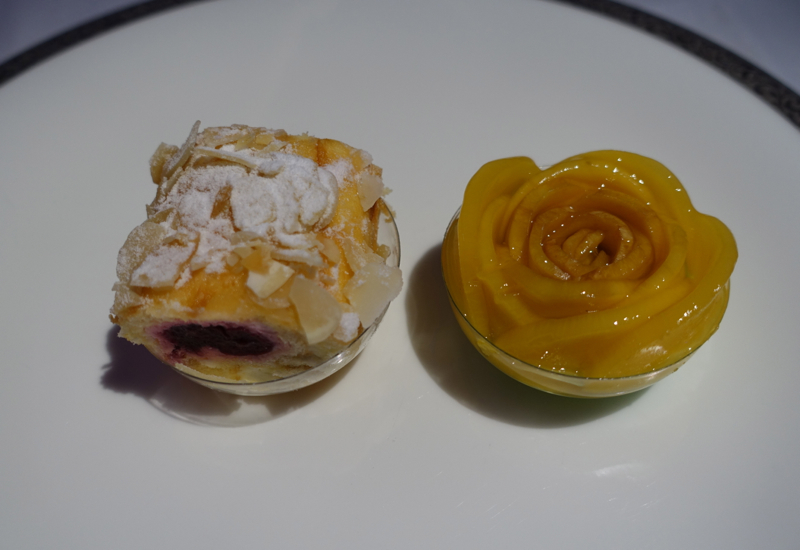 Both the sour cherry roulade and mango sticky rice looked better than they tasted, and were also served in cheap plastic bowls rather than being unmolded directly onto the dessert plate, which I thought odd. In the morning, I started with a fruit smoothie. 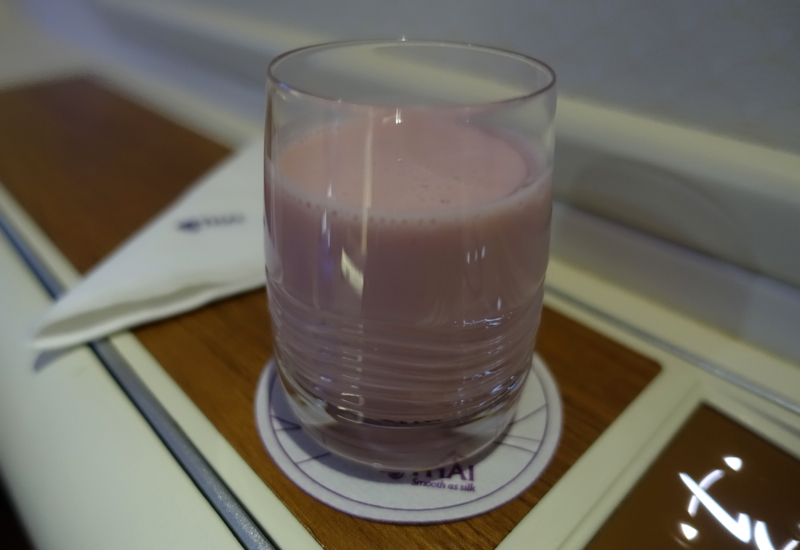 I've had some very good fruit smoothies on other airlines, especially Qantas First Class, but this one was decidedly average. 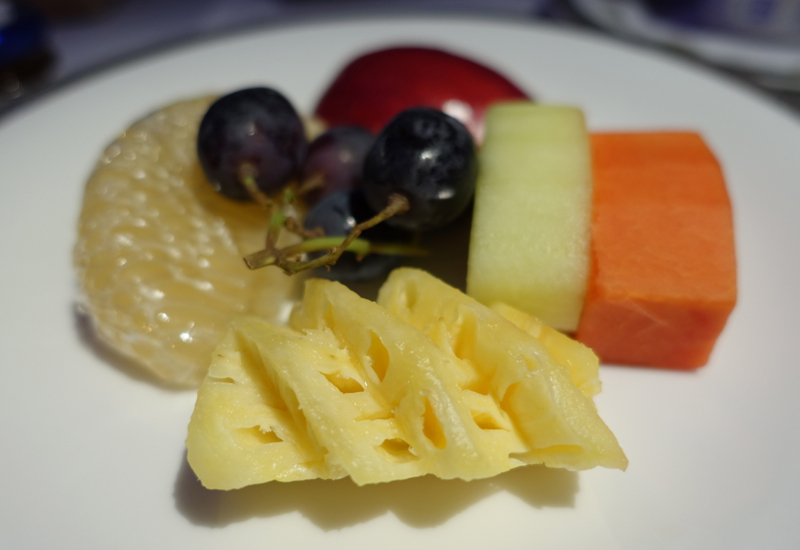 The fruit place was nice in that it included one of my favorite fruits, fresh pomelo, which is unusual for an airline fruit plate even in first class. Great to see Thai taking advantage of some local fruit and going beyond the usual melon, pineapple and grapes. 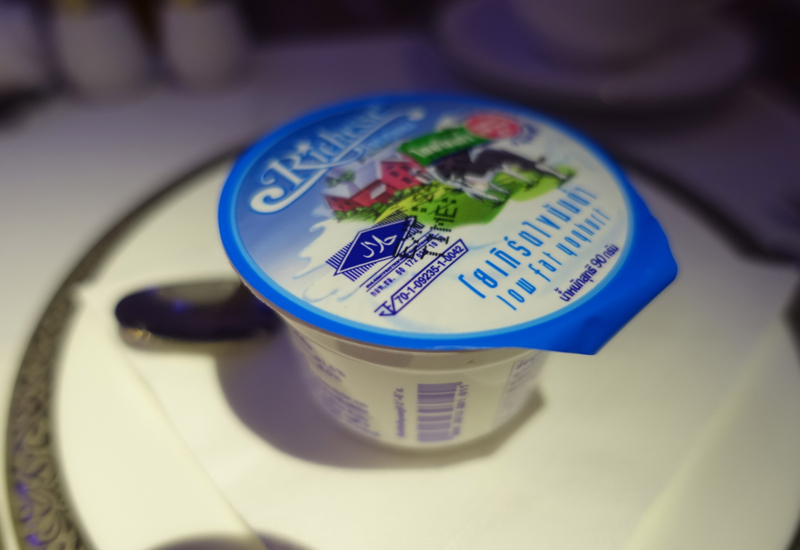 I requested yogurt, and a local brand was served–fine, but not organic and certainly not the quality of La Ferme du Manege, which I've had in Cathay Pacific First Class. For my main, I chose the Stuffed Pancake with Vanilla Custard and Mixed Fruit Compote. 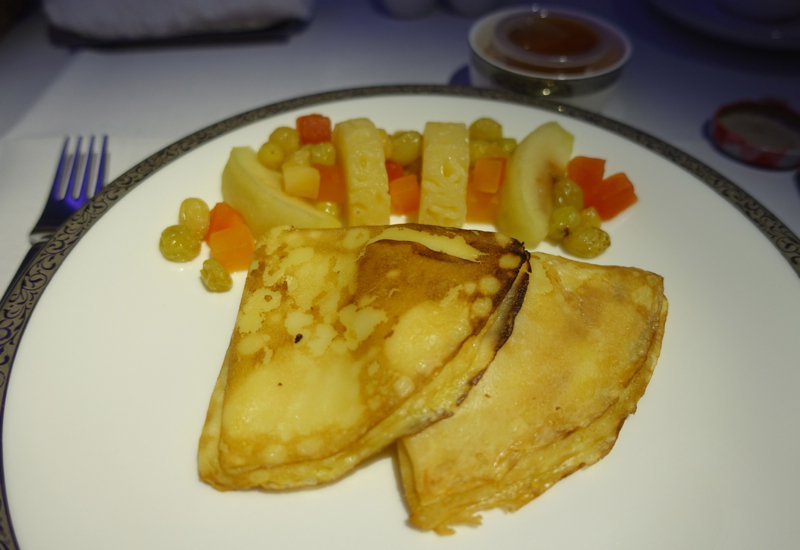 This no doubt would have made more sense on a Frankfurt catered flight, but the stuffed crepe itself was good, even though the compote was a weird combination of pineapple, apple, raisins and papaya. In my view a sour cherry, mixed berry or all apple compote would have worked better. 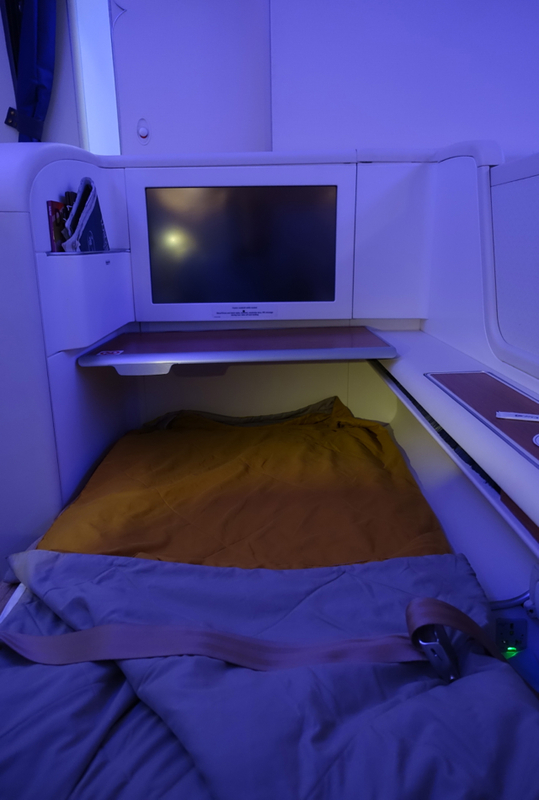 When I went to the bathroom to change into pajamas, the flight attendant very efficiently made up my seat into a bed without being asked, which I appreciated; on my most recent Asiana flight I had to track down an attendant and wait awkwardly in the aisle while she made up the bed. The bed itself was fully flat, with plenty of space at the foot of the bed as well (unlike, say, British Airways First Class). The mattress pad is very thin, nothing like the memory foam you're given in Singapore Suite or even JAL Business Class, so I didn't find it as comfortable as those products. Still, with a sleep aid, I did manage to sleep a few hours. Here's a shot taken from near the toilet, so you can get a sense of the amount of space. The lounge seat in the prior photo is on the other side of the wall. 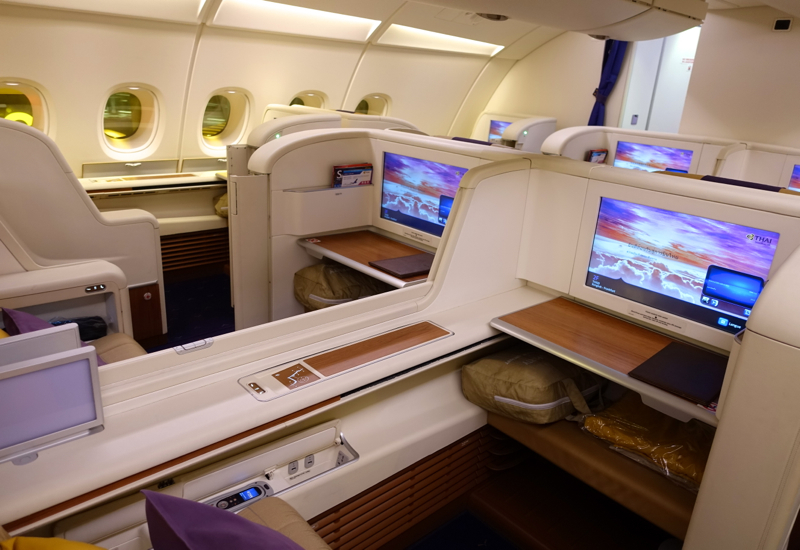 Service in Thai First Class was solid and good, but not exceptional compared to other first class products I've flown. I did appreciate the warm welcome (even if initially I didn't understand it as it was in Thai) and generally attentive service, especially the proactive turndown service. On the other hand, I couldn't help but notice that the attendants seemed to be far more attentive around the Thai speaking passengers, but I'll chalk that up to possibly these being regular travelers that they see often, or the fact that it's easier for them to converse with them in their native tongue. 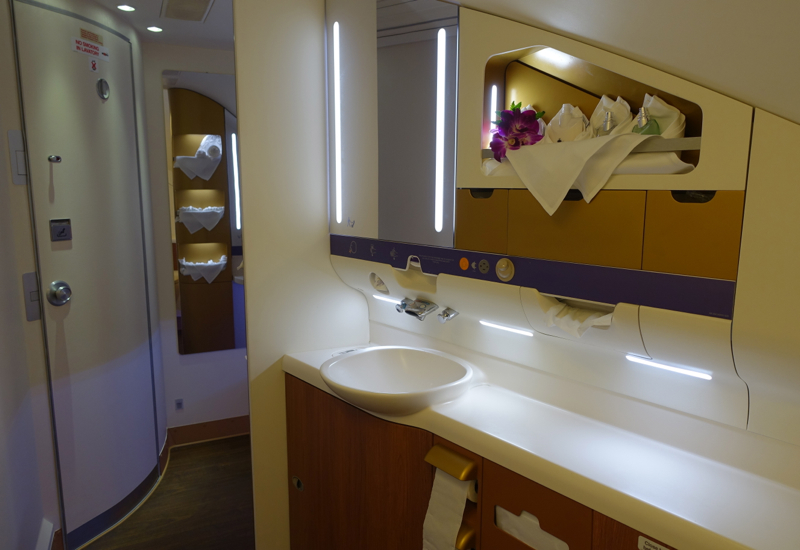 Thai Airways First Class on the A380 was a very good experience, with a somewhat uneven product. The physical seats offer a good amount of personal space and comfort, although to really be competitive a better mattress pad should be provided. 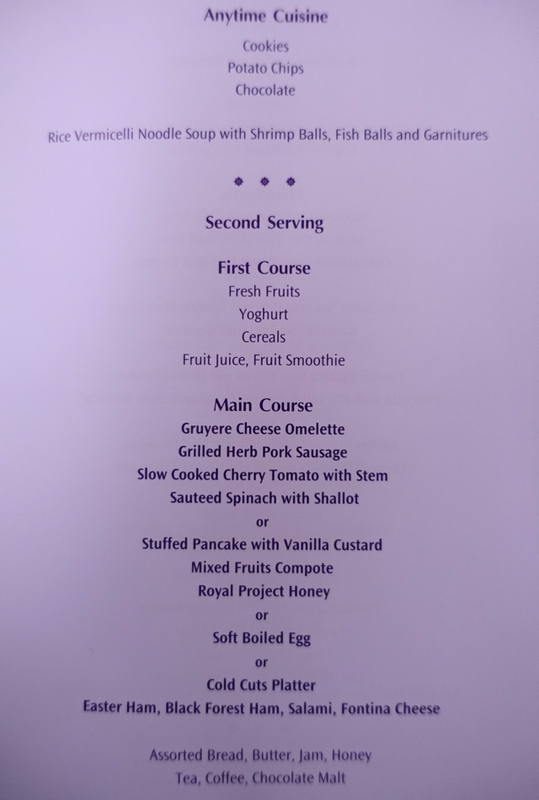 I give props for offering a pre-order menu from Bangkok, although it would be even better if meals could be easily selected online (as with Singapore Suites) instead of having to call in. 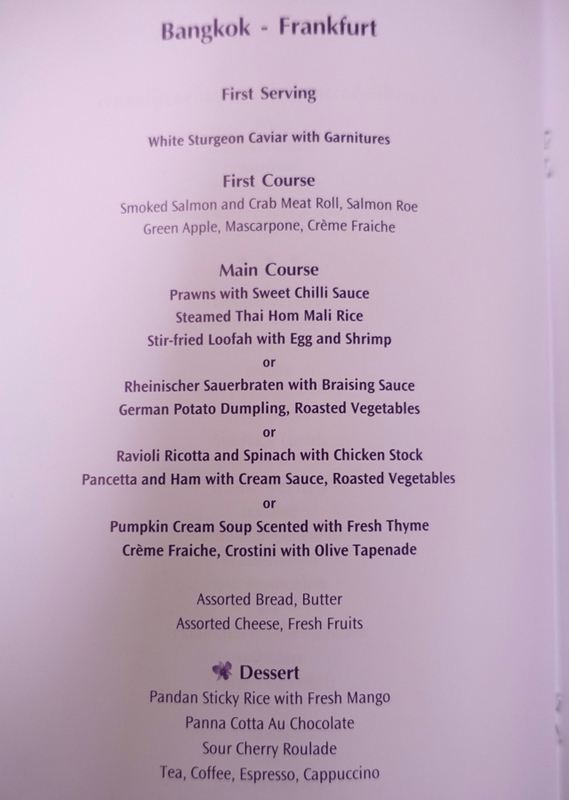 I also would put the food quality lower than Singapore Suites, Asiana First Class, Cathay Pacific and Lufthansa First Class. 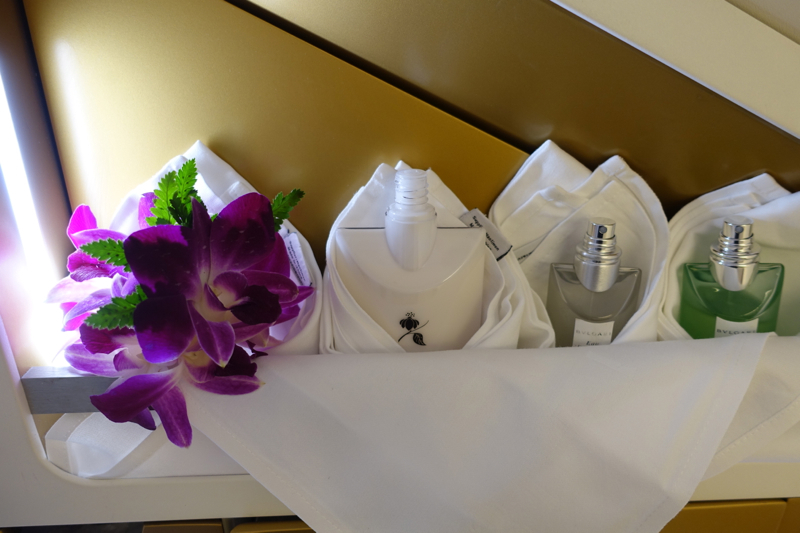 On the other hand, the ground service, namely the complimentary full body massage at the Royal Orchid Spa for first class passengers, is a fantastic way to start a long flight. 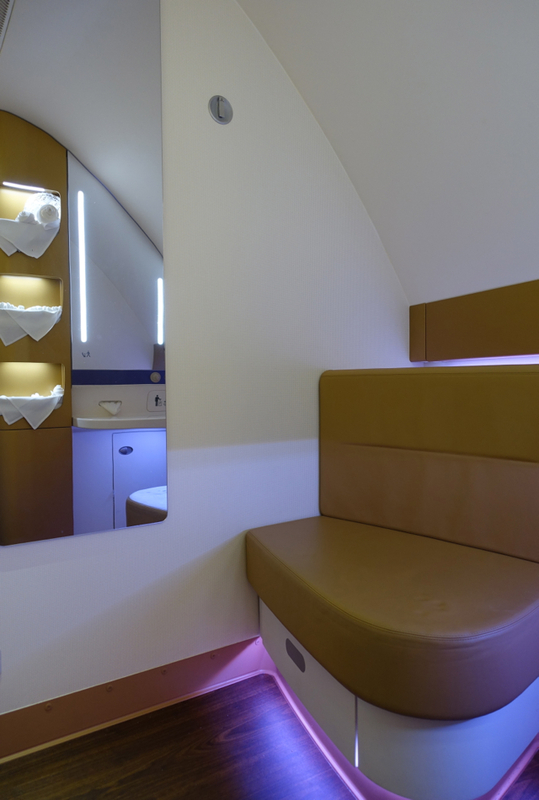 If you've flown in Thai First Class on the A380, what was your experience?